My family loves visiting Nantucket, MA, which is just a short drive and ferry ride from our home west of Boston. When we visit, we generally look for a hotel that offers lots of space for us to spread out, and is convenient to the town (we don’t usually have a car with us). This past winter, during the Nantucket Christmas Stroll, we stayed at a condo in Harborview Place located right in the town center. Harborview Place offers ten waterfront condos, all within a short walk to the ferry terminals and the town center. While we were in the largest, the three-bedroom, three-bathroom Mainsail, there are also one-bedroom and two-bedroom properties. All of the buildings offer a full, luxurious kitchen, WiFi, cable, and patios. There’s also access to a BBQ grill, and a path that goes directly down to the private beach. The buildings are decorated with a calming, clean beach theme, and the beds are incredibly comfortable. The showers are also amazing – jets shoot at you all down the front of the shower. Although we had lots of things on our agenda for the weekend, we had a hard time leaving the condo for the day – it was just that nice. Harborview Place offers complimentary transportation to and from the ferry terminals and a full-service concierge in the summer to help you plan your family vacation. 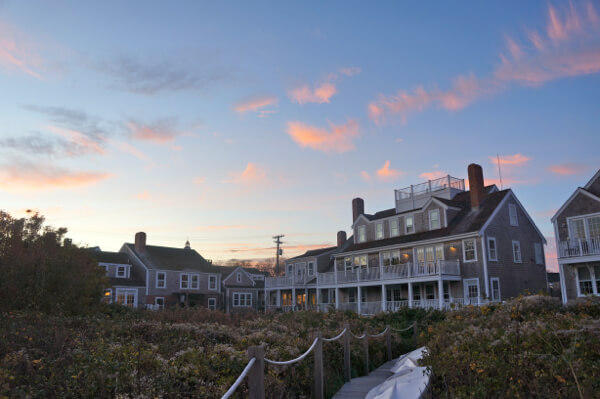 As you may imagine, prices throughout Nantucket skyrocket in the summer season. Expect to pay $1,100-$2,500 per night in the peak season, while rates decrease to $575-$900 in the slow season. Late spring and early fall are a great time to visit, when rates are lower and the crowds on the island decrease. For more information, visit the Harborview Place website. Article and photo from Jodi Grundig, author of Family Travel Magazine.